Arrive at the mangrove forest. Enjoy the tranquility while spotting birds and other creatures along the way. Arrive at the salt farm. Meet the friendly salt farmers and we'll take a walk in the salt farm. See a traditional salt storage, learn how salt is made and shop other salt products made by the locals. Enjoy homemade lunch made from fresh seafood, salt and a rare vegetable. If you are looking for a peaceful seashore place, experience salt farm local life and enjoy organic seafood , here is a hidden jewel even local Thai people find it hard. Salt farm is a kind of the real agriculture lives that you can touch. "Khok Kam" is a small community located in Samuthsakorn province. It is the place where you can learn how mangrove forest and ocean relate to salt farm, sea food and sea shore ecology system.You'll see local people leave together with mangrove & sea. At the salt farm, you can experience sea salt harvesting and natural sea salt feet spa by walking in the sea bed with your bare feet. You also can try seafood and local plant menu which can be grown in brackish water. All sun protections i.e. hat, cap, sun screen, sun glasses, sandals or washable shoes. This opportunity is truly a local immersive experience. Hansa takes you to a salt farm and through the mangrove conservation area. These two landscapes are other- worldly in themselves. 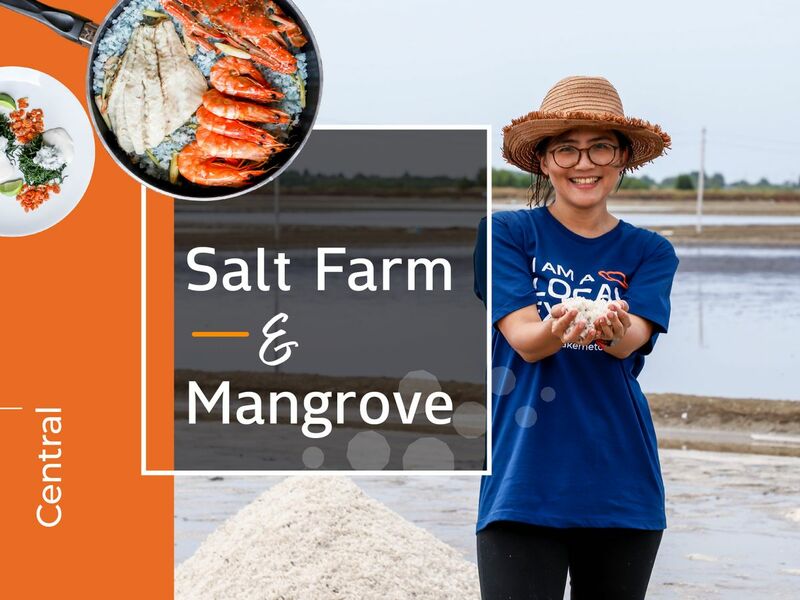 Then add personal contact with the workers, walking into the salt collection pools, learning all the stages of salt production, and viewing the lost shores and mangrove forests of the Gulf of Thailand. It is a mind altering experience. But Hansa softens the physical demands by providing cold water, snacks, a very roomy car, and coconut refreshment. The seafood lunch provides by the Baanya Sea Salt Farm was the best food I have had in Thailand. Fresh, just from the sea, and beautifully served. This tour was salty, hot, demanding and luxurious. All in one day. Do it! Thank you very much for your very nice review and your kindness to support the community. It was also a good day for me to spend a day with you. Please keep in touch. Absolutely great day! Very unique experience. We started at the mangroves which was beautiful. Then we went to her friends restaurant and got to help cook the most amazing 6 course seafood meal! Then we got to explore the salt farm and fishing area. Hansa was so welcoming and willing to answer all questions! Hansa was absolutely wonderful! She was very knowledgeable and excited to teach and engage us in the experience. Thank you very much for your nice review. It was also a good day with you and Jaisyn. Please keep in touch. Hansa is more like a friend than a tour guide. She took us to places where truly impressed her, so also impressed us. The hospitality of the Mama at the salt farm and the uncle and auntie at the fishing village, the great pictures we took, the yummy homemade food by auntie and the chats and laughs will definitely make one of our best life memories.